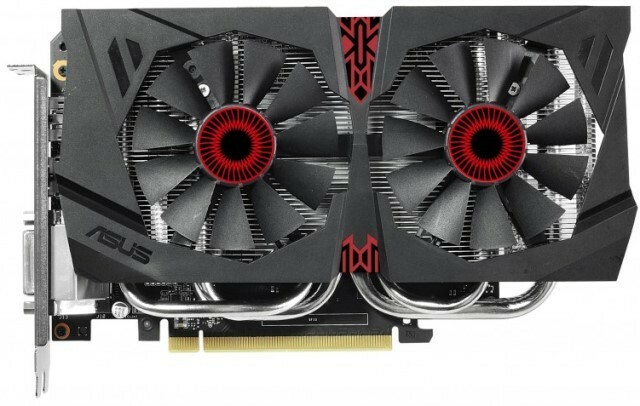 Asus has recently announced their new Asus STRIX GTX 960 DirectCU II OC 2GB, a mid-range / mainstream graphics card that is geared towards gamers who are looking for an affordable yet effective solution for 1080p gaming. The Asus STRIX GTX 960 features a factory overclocked core speed of 1,291MHz and boost clock speed of 1,317MHz, which is 12% faster vs the reference model. NVIDIA’s reference GTX 960 comes with a core clocked speed of 1,127MHz and 1,178MHz boost. It also features 2GB GDDR5 memory running on a 128-bit memory interface and with an effective clock speed of 7200MHz. It has 1,024 CUDA cores, 64 TMUs, and 32 ROPs, which is basically half of the GTX 980’s specs. The STRIX 960 was just announced but it’s already available to order from online stores. Check out the rest of its features, specifications, a few benchmarks from official reviews, price and availability below. The Asus Strix GTX 960 is an all-new gaming graphics card packed with exclusive ASUS technologies, including DirectCU II for cooler, quieter and faster performance for incredible action gaming, and 0dB fan technology for totally-silent light gameplay. The new card features feature exclusive ASUS Super Alloy Power components for enhanced durability and cooling, and GPU Tweak with XSplit Gamecaster for overclocking and online streaming that’s as simple as it is flexible. Strix GTX 960 comes equipped with a DisplayPort interface to support connections up to 4K/UHD (ultra-high definition) resolution. The Asus Strix GTX 960 is factory-overclocked at 1291 MHz and has a 1317 MHz boost clock speed in OC Mode that delivers stunning gaming performance. Strix GTX 960 provides 12% faster gameplay in Assassin’s Creed® Unity and Battlefield 4™, and runs the 3DMark 11 (Extreme) benchmark at 1920 x 1080 Full HD resolution 6.5% faster than reference designs. It is fitted with 2 GB of high-speed GDDR5 video memory that races along at boosted speeds of up to 7200MHz. The Asus Strix GTX 960 comes with the ASUS-exclusive DirectCU II cooling technology that provides 220% more heat dissipation, resulting in performance that is 30% cooler and 3X quieter than reference for incredible stability and very low noise during intense gaming sessions. Strix ups the ante even more with 0dB fan technology that lets players enjoy light gaming in complete silence, due to a thermal design that is able to keep GPU temperatures below a set level, when the fan stops completely. Enhancing cooling even further, Strix GTX 960 has a strong, rigid backplate that helps dissipate heat quickly and provides an extra measure of protection against card damage. The Asus Strix GTX 960 has a 5-phase power design that enhances energy efficiency by 15%, widens voltage modulation tolerance, and improves overall stability and longevity by 2.5X compared to reference designs. Strix GTX 960 uses a single 6-pin power connecter for clean, hassle-free cable management and has a convenient connection indicator LED to ensure successful plug-in. The Asus Strix GTX 960 comes with GPU Tweak, an exclusive ASUS tool that enables users to squeeze the very best performance from their graphics card. GPU Tweak provides the ability to finely control GPU speeds, voltages and video memory clock speeds in real time, so overclocking is easy and can be carried out with high confidence. GPU Tweak also includes a customized version of the XSplit Gamecaster streaming tool and a free one-year free XSplit Premium license. XSplit Gamecaster lets users record and share on-screen action over the internet in real time, meaning others can watch live as games are played. Gamers can also easily monitor system stats, such as frame rate, CPU load, temperature, and more, while they play, as well as modify performance settings with a simple click of the GPU Tweak button. 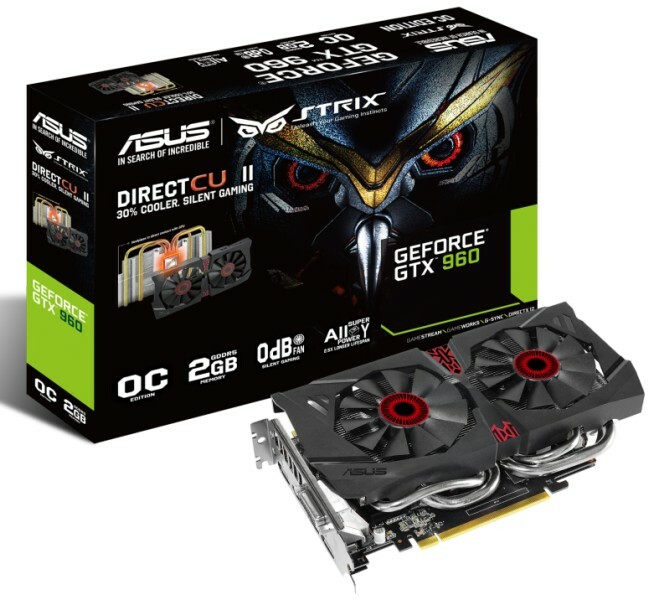 The Asus STRIX GTX 960 is now available despite being announced just recently. The reference NVIDIA GTX 960 has a manufacturer’s suggested retail price of $199 USD. The STRIX 960 however is priced a little bit higher than the reference model. It currently retails for around $219.99 and is available here. Asus is offering a three-year limited warranty for the STRIX 960. Below are various benchmark results of the Asus STRIX GTX 960. The data below are gathered from STRIX 960 reviews of KitGuru, Legitreviews, Guru3D and Techpowerup.